Bowling and entertainment facilities will have access to an exclusive set of start-up bar and restaurant service packages designed to gain efficiencies, improve the guest experience and increase revenues. We understand the importance of combining food with bowling and entertainment to provide guests with a unique experience, and are excited about this alliance and long term partnership with QubicaAMF. QubicaAMF Worldwide, the market leader in the bowling and entertainment industry, and Synergy Restaurant Consultants, a nationally recognized restaurant consulting company, are proud to announce a newly formed alliance. The alliance between the two companies will enable new bowling and entertainment investors to benefit from food and beverage start-up services to create facilities where restaurants and bars are well integrated with the entertainment offering, enhancing the guest experience and gross revenues. As part of the agreement, Synergy Restaurant Consultants will offer, exclusively to QubicaAMF clients, a package of start-up services intended for two specific types of bar and restaurant operations: fast casual and casual dining, which are the most relevant for entertainment centers today. 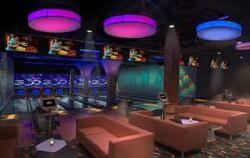 “In recent years we’ve seen a trend of the convergence between dining and entertainment, which is reflected by the increased number of Boutique Bowling and Hybrid Entertainment Centers that have been leading the new center development in US,” says Riccardo Cuppi, New Center Product and Segment Manager for QubicaAMF Worldwide. The two companies, serving two different complementary industries, have one common purpose, to make investors and operators successful in their business by offering products and services that drive results in terms of efficiency, innovation, guest experience, repeat visits and ultimately revenues and return on investment. “We understand the importance of food and beverage in new bowling and entertainment centers, which can account for more than 50% of total facility revenue. Partnering with market experts for services that are outside of our core business, such as food and beverage, is a win-win. The knowledge and experience this alliance will bring to our clients will be unparalleled,” states Jay Buhl, Senior Vice President of Sales for The Americas for QubicaAMF Worldwide. QubicaAMF Worldwide is the leading manufacturer and marketer of bowling and amusement products. With worldwide headquarters near Richmond, Virginia and European headquarters in Bologna, Italy, the company offers a complete line of high-quality, innovative solutions for new and existing bowling and entertainment centers. QubicaAMF has over 50 years of experience and an install base of more than 10,000 centers, which includes AMF Bowling, the world’s largest owner and operator network of bowling centers. The company has sales offices in 15 countries, a distributor network with worldwide reach and maintains the largest R&D team for software, electronics and entertainment systems in the industry. Additional information about QubicaAMF Worldwide is available at http://www.qubicaamf.com. Synergy Restaurant Consultants has a team of energetic and creative restaurant management experts who have been bringing big ideas and proven solutions to clients for the past 25 years. Founded in 1988 by Dean Small and Danny Bendas, Synergy Restaurant Consultants is the leading nationally recognized restaurant consulting firm dedicated to helping foodservice operators and manufacturers improve their performance while enhancing the guest experience. Synergy has a proven track record of more than 200 US restaurants in almost every dining segment, including 30 of the 50 most prominent and leading edge restaurant chains in the US such as LYFE Kitchen, TGI Friday’s, California Pizza Kitchen, and Fleming’s Prime Steak House. Synergy specializes in new concept development, menu engineering and development, foodservice operations assessments and food reviews, and restaurant and kitchen design and optimization to name a few. Additional information about Synergy Restaurant Consultants is available at http://www.synergyconsultants.com.